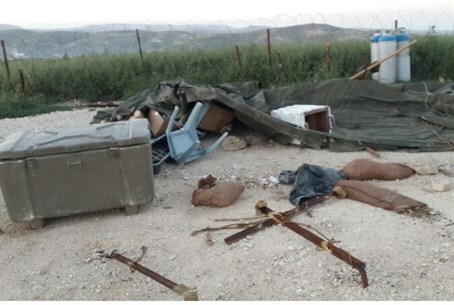 Extremist youths vandalize IDF outpost, but ensure IDF soldiers are unhurt; unit shocked. Clashes between the IDF and Yitzhar residents Tuesday morning ended with four homes demolished, but also an IDF outpost destroyed. Arutz Sheva spoke to a commander from the Judea and Samaria division, who was at the scene, about the details and causes behind the incident. "We have already been deployed here for three weeks," the officer explained. "Early this morning, about fifty men came to the outpost - which defends Yitzhar's Western entrance from terrorist infiltrations - and destroyed everything here: fuel, diesel fuel, heating gas, food, everything." The officer clarified that while six soldiers were at the outpost at the time, none were hurt. "Although the rioters destroyed everything that was inside the outpost, the soldiers were not prepared for such a situation," he continued, explaining that they never expected to see "Jews attacking Israeli soldiers." "We are working to protect the community and other communities from terrorists and not against Jews," the officers said. He added that "the rioters asked the soldiers to stand still, they were not threatened at any stage...therefore, we didn't react with violence." Yitzhar has been the center of dramatic clashes between the IDF and an extremist element in the town this week, which began after IDF Colonel Yoav Yarom found his tires slashed outside the community. Yarom stressed to Arutz Sheva earlier Tuesday that the Yitzhar residents themselves were helpful and apologized immediately over the vandalism. However, the situation snowballed quickly, after officials labeled the tire-slashing a "terrorist act," and a minor was arrested in Jerusalem on suspicions of participating in the attack. On Monday, the minor was released to house arrest; however, a possible copycat attack 24 hours later drove tensions over the edge. The IDF declared the move a "red line" and began an investigation into Yitzhar; the raid caused intense clashes between local residents, who are weary of frequent raids and demolitions of private property, and police forces. Tuesday morning, the IDF and other security forces began demolishing homes in Yitzhar, as extremist youths vandalized IDF outposts. Politicians from all sides of the political spectrum have condemned the attacks - albeit for different reasons - and many have stressed that the greater Yitzhar community is not behind the extremists.